Need a quick weeknight dinner and don’t feel like heating up the house? This 4-ingredient budget-friendly dish, cooked on the grill, is full of flavor and low in carbs. If desired, serve it with a side of wild rice or quinoa. Preheat a grill to medium high. Spray a grill rack with cooking spray. 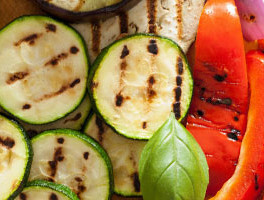 Add the zucchini and peppers to the grill or veggie basket and grill for 8 to 10 minutes, until tender. Place the chicken sausage on the grill and heat through for 4 to 5 minutes, turning frequently.